Whatever your interests there is something in this area for you. 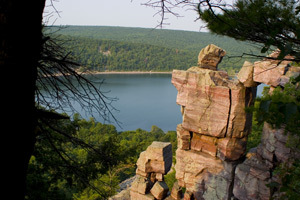 A few examples: Nature lovers can enjoy Devil’s Lake, Lake Wisconsin, Parfrey’s Glen or Natural Bridge State Park. 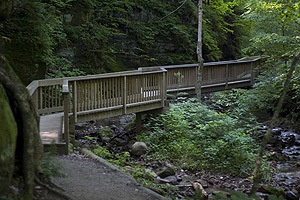 You can take scenic hikes, bicycle tours, mountain biking, cross-country skiing or snowmobiling. Nearby Lake Wisconsin offers sailing, water skiing and fishing. There are many good fishing spots in the area where you can try your luck angling for trout, bass, walleye, northern pike, pan fish and many more species. The Wisconsin Dells area offers scenic boat rides and rides on their world famous amphibious ducks. There are several challenging golf courses in the area for the golf enthusiast. 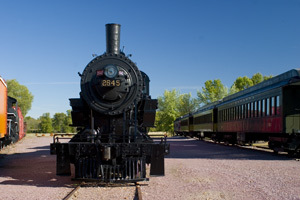 Within twenty minutes of Rustic Ridge you will find many exciting attractions at Wisconsin Dells, the Circus World Museum, Ho-Chunk Casino, the Wollersheim Winery and the International Crane Foundation. Two of the Midwest’s largest ski areas — Devil’s Head and Cascade Mountain are nearby with runs for all skill levels. Or simply sit back, relax and enjoy the quiet in our beautiful wooded setting.